Coming soon: Singapore and Canada company representatives. Tank Storage Magazine - New Pipe Support Barrier Reduces Corrosion and Installation Costs. Check out our corrosion solutions here. Company has implemented an Inventory Barcode System to track all pipe supports from inventory control to installation with the GS1 System used globally. Lift Off Pipe Supports has successfully designed, manufactured, tested and installed the LOR and LORAN patented supports for a new client. 8 June, 2016: "Lift-Off" Pipe Supports, a Lake Charles, La. 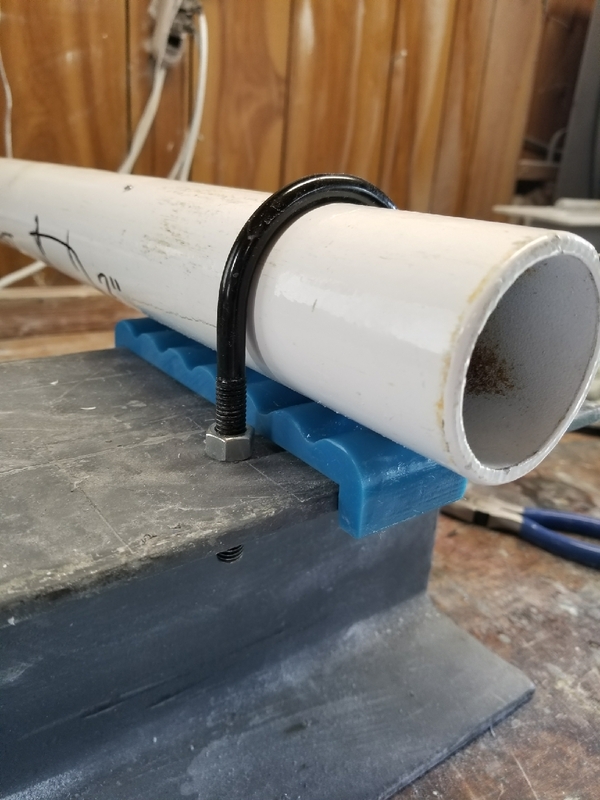 company has successfully designed, manufactured and tested a unique pipe support method to address pipe corrosion at the support point. Lift-Off Pipe supports has successfully delivered our 8LORB pipe supports for a pipeline company with very good results. Lift-Off pipe supports have received the Patent certificate from the United States Patent Office. Other products are patent pending and the trademark has been registered. 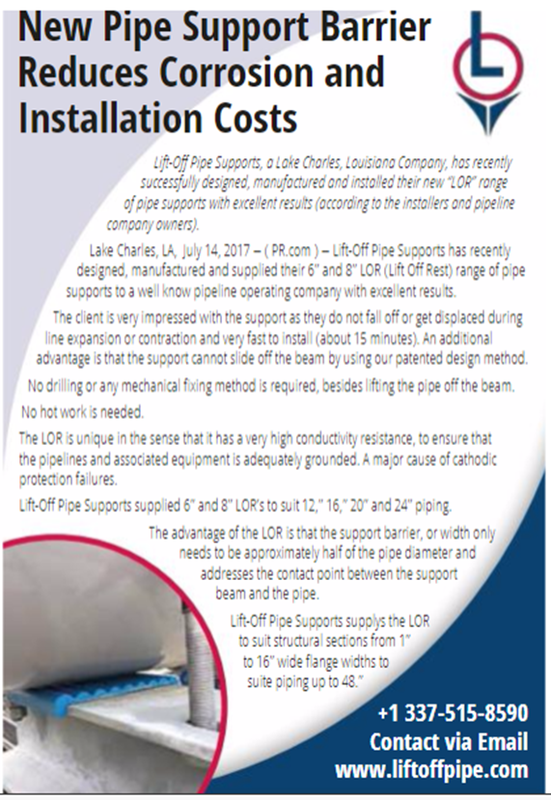 "Lift-Off" Pipe Supports has introduced their New Large Diameter Pipe Supports, from line sizes 8" to 48". The design caters for non-insulated lines. 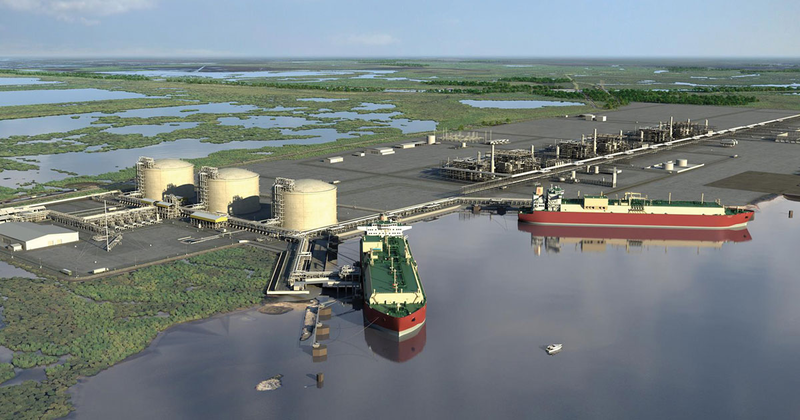 The design was developed for customers that require reductions in construction, inspection and maintenance costs. Successful trial fitting of a 6LOH for a 2” line prior to shipping. The width is only 1.75”. Load test completed at 4000 lbs. 8 Sept, 2017: Tank Storage Magazine - New Pipe Support Barrier Reduces Corrosion and Installation Costs. 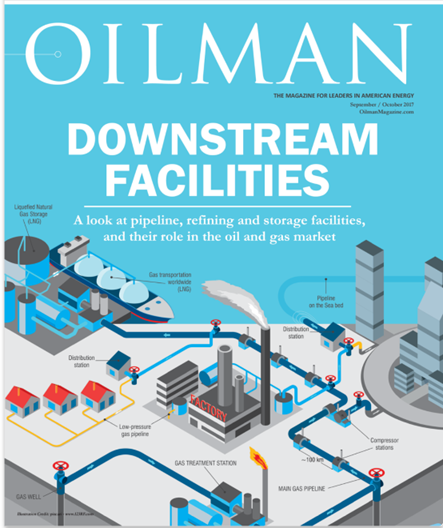 8 Sept, 2017: Oilman Magazine - Check out our corrosion solutions here. 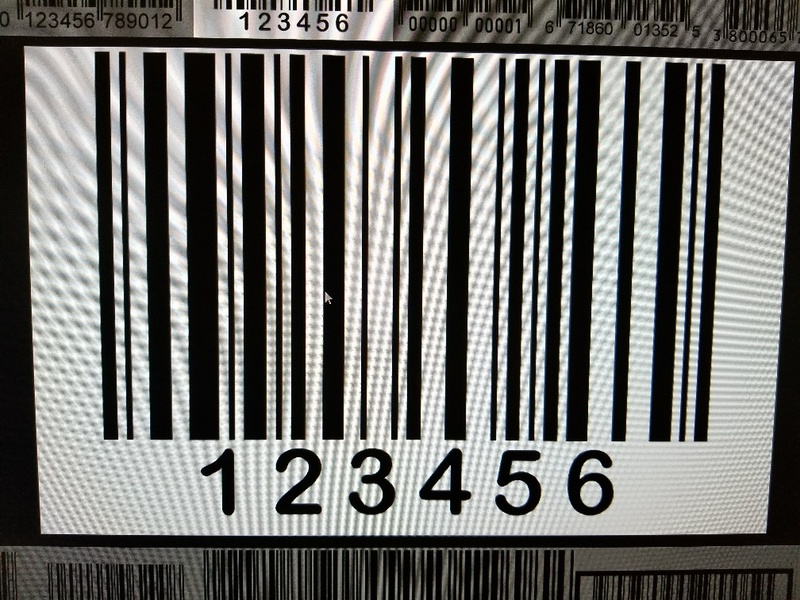 12 July, 2017: Company has implemented an Inventory Barcode System to track all pipe supports from inventory control to installation with the GS1 System used throughout the USA. 25 June, 2017: Trial fitting of a 6LOH for a 2” line prior to shipping. The width is only 1.75”. Load test completed at 4000lbs. 15 June, 2017: "Lift Off" Pipe Supports has successfully designed, manufactured, tested and installed the LOR and LORAN patented supports for a new client. 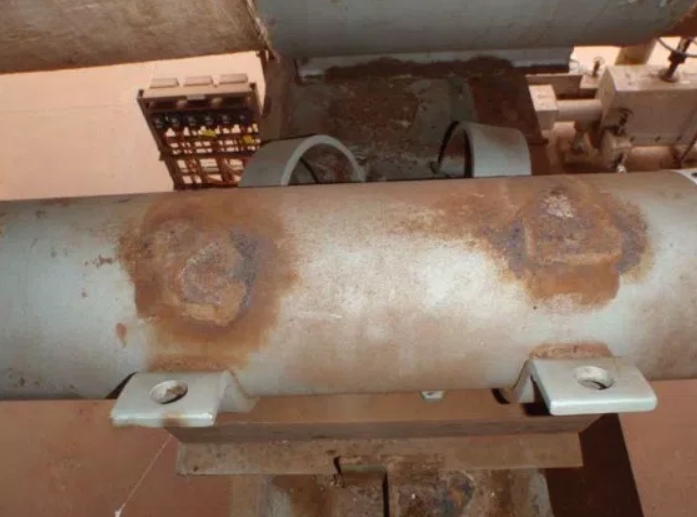 The "Lift-Off" pipe support compliments most regular supports by introducing a load bearing barrier between the pipe and the support element, where corrosion normally occurs trapping liquids and damaging protective coatings. "Lift-Off" addresses this situation by draining the trapped liquid by means of a set of polished lobes, reducing friction as well as assisting the flow of liquid from the piping. In addition to the draining aspect, once the liquid has been drained, the support also has reverse convection to dry out the piping and support contact points, thereby mitigating moisture absorption into the coating and blistering. Lift-Off" pipe supports are designed for the Marine, O&G, Utility, Food Processing, Chemical and other allied industries where accessibility is at a premium. Available pipe support sizes: 1" to 24". 6 June, 2017: "Lift-Off" Pipe Supports has successful delivered our 8LORB pipe supports for a pipeline company with very good results. 1 May, 2017:"Lift-Off" pipe Supports have received the Patent certificate from the United States Patent Office. 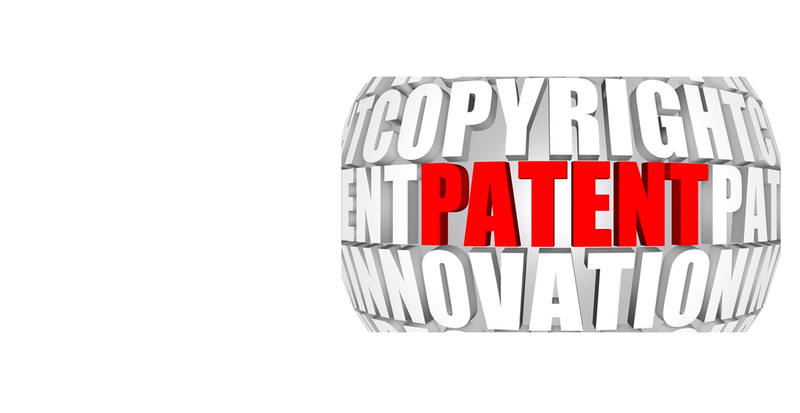 Other products are patent pending and the trademark has been registered. 14 August, 2016: "Lift-Off" Pipe Supports has introduced their New Large Diameter Pipe Supports, from line sizes 8" to 48". The design caters for non-insulated lines. 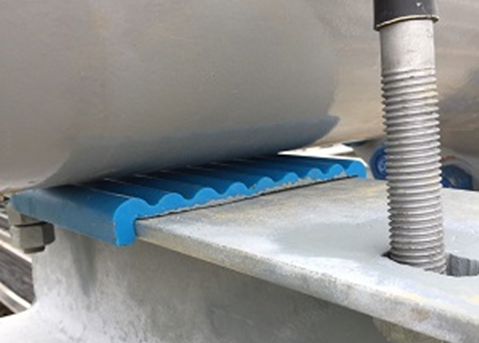 The slide plate or bearing plate can also be removed and replaced very easily (Lift the line up, remove the old wear pad, drop the new pad in and lower the line in position, done). The supports can be bolted, welded or installed with most common fastening methods. 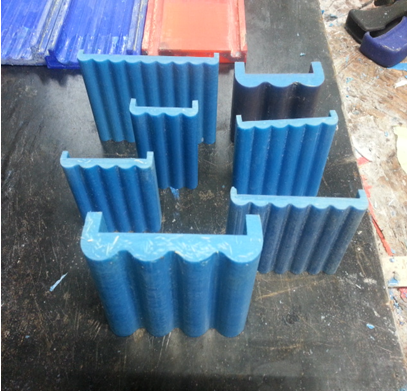 The slide plates can be made from a large variety of materials. 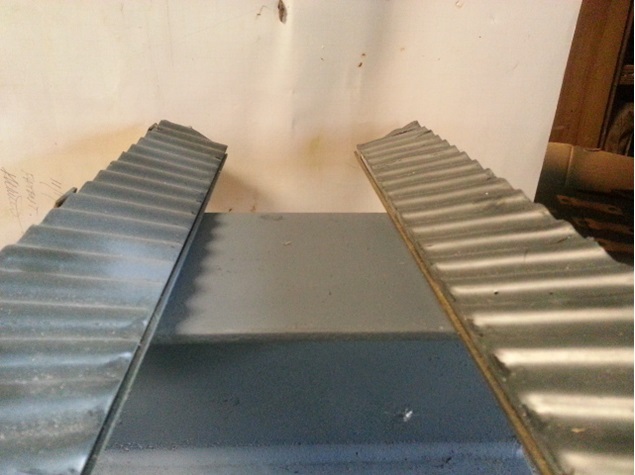 The support raises the line by approximately 5/8" off the support beam (variable height), to allow for drainage. The design also caters for convection currents to dry out the support and is also less susceptible to UV and atmospheric conditions, as conventional supports often fail due to UV and differential expansion with the mating parts. 19 June 2016: "Lift-Off" Pipe Supports have installed a line stop on a highly vibrating line in record time "without any hot-work". The installation was performed in about 10 minutes, once access was allowed. Results were "very positive". 3 June 2016: "Lift-Off" Pipe Supports have successfully designed, manufactured and tested our new range of Carbon-Fiber (CF) and Fiber-Composite (FCA) pipe supports. 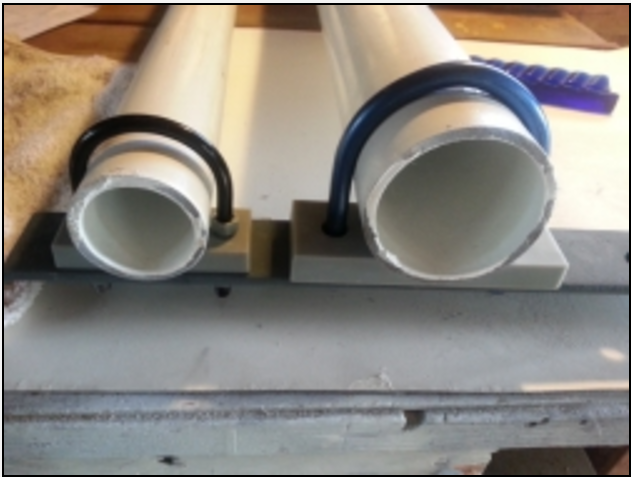 Our studies have found that Marine and High Salinity resistant pipe supports have not addressed the situation adequately. Specifically the draining of trapped liquids at the pipe support, a major contributor to pipe corrosion. The supports are able to withstand Cryogenic, flame/fire resisting conditions coupled with a BIG REDUCTION IN WEIGHT without sacrificing strength.